I would like to know the approximate value of a Musical Dynasty doll. I want to sell it, but have no idea where to start. These dolls are mass produced and so plentiful that most are not valued at more than $30 but usually even less. 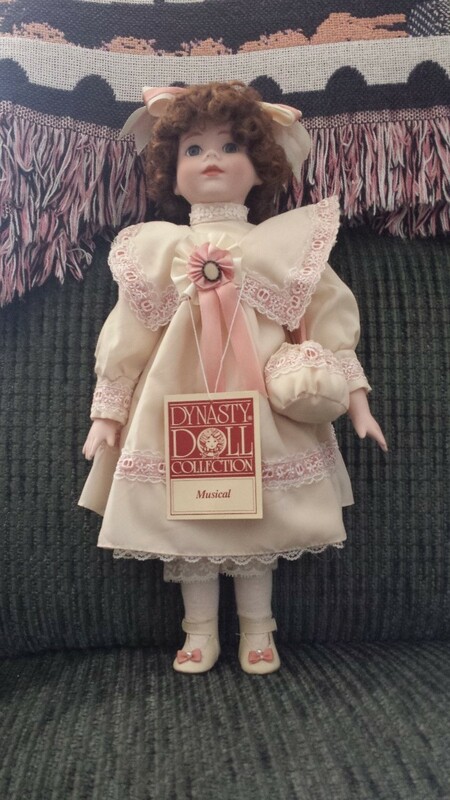 The only information supplied is "musical Dynasty doll" so it would be difficult for someone to pinpoint your doll. You may be able to go on eBay and use the dolls name and size and find your doll. Here are typical listings on eBay (the largest doll site in the world) and also the third link is to dolls recently sold. They are worth about 20 dollars.You can go on E-Bay over a two month period and watch what your doll sells for.Make sure it is actual sales and not listed prices.You could try selling it for more at a yard sale or somewhere else.